What Is New in WordPress 3.3? Quickly review several new WordPress 3.3 features that make WordPress easier, faster, and more convenient, including new Admin and Uploading Tools; Feature Pointers; and easier Tumblr import. Learn what WordPress is, and how it has evolved into a full-featured program for creating both blogs and complete websites. Tour some typical sites created with WordPress, and discover how it can help you create everything from custom content and user forms to tag clouds. Sign up for a WordPress.com account, and set up WordPress as a hosted blogging solution that relies on Automattic (WordPress’s company) to handle hosting, updates, and security. Perform a one-click install for WordPress at your own Internet hosting provider, including steps you might need to take before you start. Learn how to work with a typical service provider’s Dashboard. Install WordPress manually, on empty website space provided by an Internet hosting provider. Retrieve and extract WordPress files; copy them to your provider’s server; create a configuration file; securely link a database, and more. Get comfortable with what you’ll see after you first log in to WordPress, including the new login screen and Dashboard. See which tools are available to you, and organize your WordPress interface so it’s easier to use. Create new posts, and manage posts once you’ve created them. Discover WordPress’s extensive options for scheduling, placing, publishing, and deleting posts; and for controlling whether they are public or restricted to specific readers. Use the WYSIWYG Editor to enter text in WordPress, and then format text, paragraphs, numbered and bulleted lists, blockquotes, alignment, links, and more. Master editing tools such as spellchecking; and copy Microsoft Word text without Word’s troublesome HTML formatting. Organize posts into Categories, including hierarchical “Parent” and “Child” categories, with descriptions. See how Categories appear on posts, and how they fit into your site’s structure. Organize posts with Tags, and see how they are similar and different from Categories. Reuse existing tags, and learn tips for using tags more effectively. See how Tags can be used with WordPress’s popular Tag Cloud feature, and how they can be converted to Categories. Create Comments, and use the Comments panel to manage them. Use WordPress moderation to publish, block, approve, or “unapprove” comments. Use QuickEdit to edit site comments. Understand Pages and how they differ from Posts. Use the Pages panel to create and manage Pages such as About Us, Contact Us, or Home. Create a page header, review “slugs,” and set Featured Images and Page Attributes. Use Media Library to import audio, video, and images, and use them throughout your site. Create titles, alternate text, captions, and descriptions for your image. Use WordPress’s image editing tools; create thumbnails, and link to images from other web servers. Use the Links Panel to create a Blog Roll that manages and organizes links to other web pages. Edit links, and specify what happens when a visitor clicks them. Use Link Relationships, Advanced Options, and link ratings; and restrict certain links to authorized users only. Change your site’s look and feel with Themes. Manage, active, and preview Themes; search for themes on WordPress.org; and install new Themes. Download and install themes from other sites. Learn how to edit Themes manually. Use Widgets to add capabilities to your site. Add and remove Widgets, and control how they appear on your site. Use WordPress’s custom Menu system to reorganize your Menu structure. Incorporate Pages on your own site, Categories, or even content from elsewhere on the Web; then, control the behavior of your Menus. Use Plug-ins to add capabilities to your site. 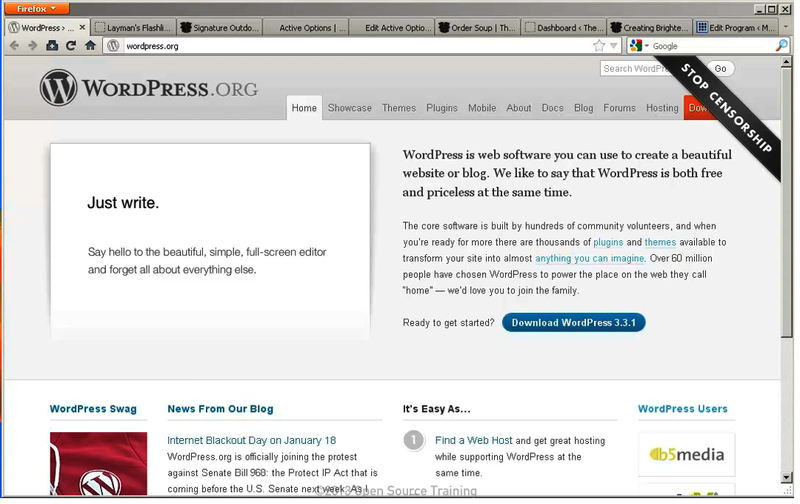 Find and install new plug-ins from WordPress.org, or upload a plug-in you’ve already purchased. Get important details about plug-ins, and update them to reflect improvements or security fixes. Explore Contact Form 7, one of today’s most popular free plug-ins. Install it, and use it to create a custom contact form that can send an email message to you or anyone else. Use WordPress’s built in Photo Gallery section to quickly add pictures to your site, and control the Galleries it displays. Adapt the standard PhotoGallery with plug-ins. Create new users, and manage users and their roles (Administrator, Editor, Author, Contributor, or Subscriber). Allow users to register themselves as Subscribers. Understand how ownership of content works, and how it is displayed. Delete existing users. Review the Tools panel of the Administration area. Use tools such as the PressThis bookmarklet, which makes it easy to blog about other web pages and sites. Import content from other blog systems, or from RSS feeds. Use the many options available through your Settings Menu, including General, Writing, Reading, Discussion, Media, Privacy, and Permalink Settings. Use MultiSite to run multiple sites or blogs from a single installation of WordPress, sharing plug-ins and themes amongst them all, and making them all easier to maintain. Create and edit new sites in a MultiSite environment. Establish administrators and users; then define each site’s capabilities, Themes, Plug-ins, network settings, upload settings, available space, and more. Learn the basics of Search Engine Optimization, and how to overcome simple problems and mistakes. Then, use the WordPress Dashboard tools and the popular WordPress SEO by Yoast plug-in to attract higher rankings from Google and other search engines. Attract and keep more visitors by improving your site’s responsiveness and loading speed. Use YSlow, PageSpeed, GTmetrix, and WebPageText to identify bottlenecks on your pages, so you can fix them. Use web page caching to make your site run faster. Install a leading WordPress caching plug-in, WP Super Cache. Next, learn easy and advanced caching techniques, as well as specialized techniques related to content delivery networks and other site issues. Explore the HTML and PHP pages WordPress creates for your site, and then make simple adjustments to WordPress themes by directly editing HTML code and PHP scripts. Learn how WordPress manages CSS style sheets. Then, safely make simple edits to style.css, the file that makes WordPress Themes work. Explore Theme Frameworks that can help you extend WordPress’s capabilities — for example, to more effectively support photos, videos, or book functionality; or to add more layouts, colors, and schemes. Create a Child Theme that is based on the characteristics of another theme, and then adapts its appearance or extends its capabilities. Use the DISQUS Comment System service and plug-in to improve the way you manage comments on WordPress sites. Sign up for a DISQUS account, link it to your site, set up features such as likes and trackbacks, and use DISQUS’s enhanced moderation tools. Set up a site forum with the BBPress Discussion Board System. Install the bbPress plug-in; create individual forums, topics, tags, and breadcrumbs; prevent forum spamming; and troubleshoot problems. Integrate your WordPress site with Twitter. First, get your Twitter posts onto your site with Twitter Widget Pro. Next, use the WP to Twitter plug-in to automatically post your WordPress content onto Twitter. Discover the advanced WordPress forms manager Gravity Forms. Tour its features, including Multi-Page Forms, Advanced Field Types, forms scheduling, pricing fields linked to PayPal, and more. Drill down with Gravity Forms to explore advanced capabilities such as Conditional Logic, forms with page breaks, sophisticated validation, and file upload options. Use a different remote Internet Service Provider to handle your email, so your standard ISP does not misinterpret growing outgoing email traffic as spam. Use Subscribe2 to let people subscribe to your blog, so they receive email updates without visiting your site. Set up subscription options, including scheduling and tracking. Enable visitors to start, change, and stop their own subscriptions. Add media podcasting to your blog, using your site’s default RSS feed and the easy-to-use Podcasting Plugin by TSG. Customize podcast titles, set up iTunes-specific attributes, embed media players, and create audio or video posts. Get started with e-commerce in WordPress. Compare some of the leading e-commerce plug-ins, understand the pros and cons of each, and decide which one is right for you. Install and set up the Cart66 e-commerce plug-in. Explore the pages Cart66 provides to support shopping carts and payment. Set up location, currency, SSL encryption, checkout, shipping, pricing options, and more. Review additional administrative areas of Cart66, including product and item data; digital download options; product variations; tax status, and order settings. Use Cart66 to place products on the “front end” of your website, where users can see them and make the decision to buy. Control the way you present your products to users, including descriptions and images. Use Restrict Content Pro to restrict some or all of your content to paying readers. Establish Free Content and Premium Content messages; set up Payment options, including PayPal and Stripe; define registration and redirect pages, and more. Use Justin Tablock’s Query Posts plug-in widget to flexibly display and update content in your blog or site’s sidebar. Control a wide variety of options, from size to sequence. Use the Widget Logic plug-in to precisely control which WordPress widgets appear on each page, using WordPress conditional tags such as is_front_page(). Turn on WordPress’s XML-RPC remote publishing capabilities. Then, use Postie to blog via email when you don’t have access to a browser, or want to post quickly from a mobile device. Check and fix broken links with Broken Link Checker. Control which links to check; track the progress of link checking; notify authors of broken links from their posts; stop search engines from following broken links; and more. Install and register YoLink to improve site search within your site. Crawl your site with YoLink to find content and submit it for searching; choose whether to share YoLink search results with other web services; and more. Add Google Analytics to your site using the Google Analytics for WordPress plug-in. Set the right Analytics Profile; authenticate with Google; choose an account; and review other basic settings. Pull Google Analytics information into your WordPress Dashboard, so you can review your site’s performance without logging into Google Analytics itself. Understand how WordPress.com’s JetPack statistics package differs from Google Analytics. Then, set up and enable JetPack, and briefly explore JetPack’s statistical settings. Conclude with a brief summary of the features and plug-ins covered throughout WordPress Explained. WordPress Explained will help you learn WordPress: the world's most popular way to build a website. The WordPress trainers from OSTraining.com have taught thousands of beginners just like you. WordPress Explained requires absolutely no experience with WordPress, website construction or coding. This video takes WordPress Users on the learning curve from confusion to results by teaching all of the essential concepts and knowledge you need to build and manage a WordPress website. Starting with an introduction to WordPress and how to install it, the video will detail how to add content, control users, make links and then add extra features to a WordPress site. The video simplifies things to avoid difficult tasks that are unnecessary for beginners to understand and offers clear instructions, simple explanations, and real-life examples.